420 grams of pastry flour, 3 eggs, half a glass of dry white wine, 3 table spoons of sugar, 500 grams of honey, 120 grams of almonds, 120 grams of mixed candy fruit, extra virgin olive oil and frying oil. Mix 400 grams of flour with the eggs on your kneading surface, the wine, half a glass of extra virgin olive oil, and 2 spoonfuls of sugar until you get a consistent but soft dough. Let the dough rest for 30 minutes with a kitchen cloth on. Now divide the dough into pieces and create small cylinders as large as your little finger, then cut them to obtain small dumplings. Round the dumplings with your hands until you get small balls of dough (these are called the cicerchie). Set the frying oil in a skillet. Pour in a large amount to allow the dough balls to float freely. When the oil is very hot, pour in the dough balls and fry them. They will be ready when lightly brown. After each batch is ready, set it on paper towels to absorb the excess oil. Now pour the honey in a pan with the remaining sugar, and start heating it up over low heat until the mix is liquid. Now add the fried dough balls, the sliced up almonds and the diced candy fruit. 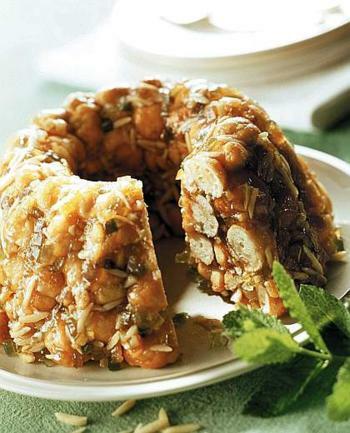 Mix everything and set it in an oiled pudding mold. Let it cool at room temperature, then gently remove it from the mold on the serving plate. This delicious pastry owes its sweetness to scented honey more than to sugar, therefore you will need to pair it with a decisive but sweet wine. A good choice would be the Vin Santo Colli del Trasimeno.